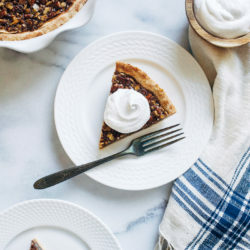 The Best Vegan Pecan Pie- made with just 9 simple ingredients, you would never guess this pecan pie is made without eggs or corn syrup! 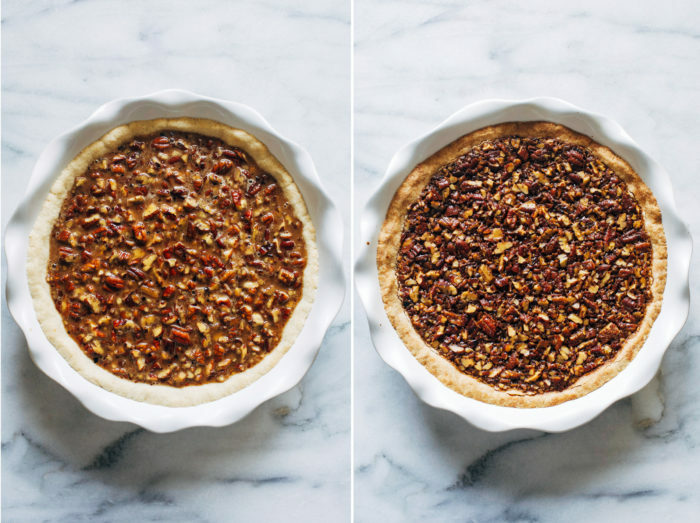 Now that we have a super easy pie crust, let us discuss the pecan pie. As in the BEST vegan pecan pie on the face of the planet. 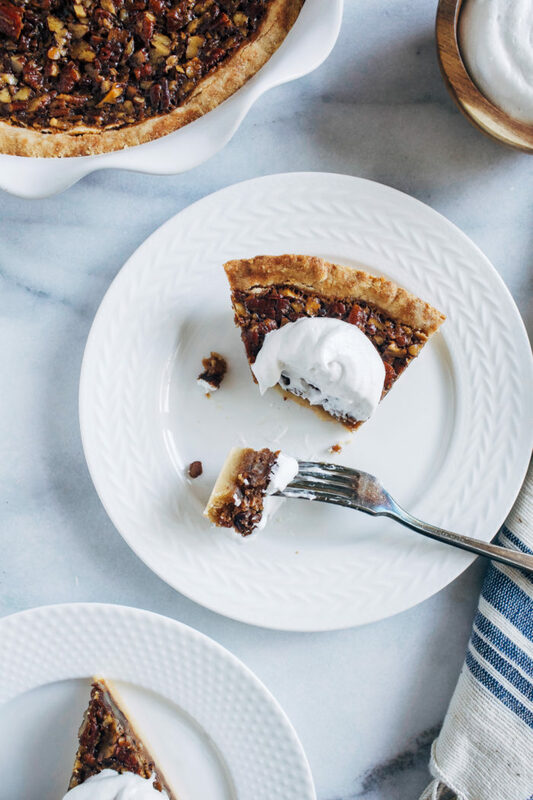 Growing up in the south, I ate my fair share of pecan pie. I’m also confident that approximately zero of those pies were vegan. Most recipes call for eggs, butter and corn syrup. You know, typical southern ingredients. But the reality is you don’t need all of that to make one bangin’ pecan pie. 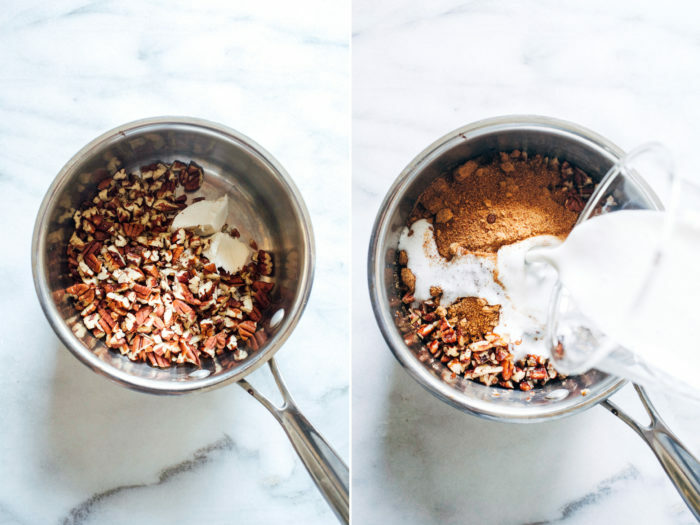 With just 9 simple ingredients you can whip up a healthier pie that everyone will love. To make a vegan version that was just as good as the classic I used top notch vegan butter (Miyoko’s you da best), pure maple syrup, coconut sugar, organic corn starch and creamy coconut milk. The maple syrup, butter and coconut sugar create a salty, caramel-like flavor while coconut milk offers a creamy texture. If it weren’t for the corn starch the recipe would also be grain-free but it is necessary for binding and firming the pie. Arrowroot might work in it’s place but I find it to be more finicky so I opted for corn starch. It’s the safer choice here. While this pie takes all of 15 minutes to prepare, it does require a lot of time to set as it cools. 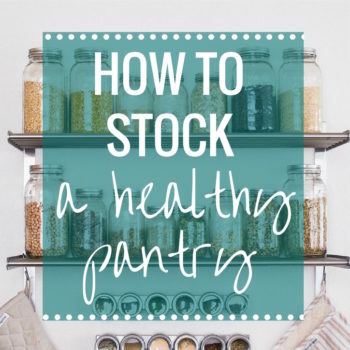 This means that you need to prepare it at least a day in advance. Which I think we all do anyway, right? If you or your loved ones like pecan pie then I hope you get a chance to try this one! It’s a winner. Preheat the oven to 350°F then parbake your prepared pie crust for 7 minutes. Set it aside to cool. In a measuring cup, combine the coconut milk and cornstarch then whisk until smooth. In a saucepan, melt the vegan butter over medium heat. Add the pecans and toast in the pan for about 30 seconds while stirring continuously. Pour in the maple syrup, coconut sugar, coconut milk mixture, vanilla and salt. Whisk until smooth. 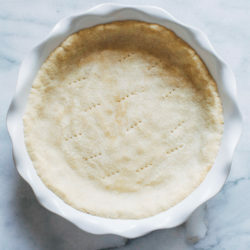 Remove from heat then pour the mixture in the pie crust until filled to about 1/4-inch of the top of the crust. Bake in the oven for about 30 minutes, or until filling appears mostly firm when you gently jiggle it. Cool on the counter for 2-3 hours then cover and store in the refrigerator for at least 8 hours, ideally overnight. Allow to sit at room temperature for at least an hour before serving. If it’s too cold then it will be firm but serving it at room temperature makes for the perfect texture. That looks so good and I love that it doesn’t have corn syrup in it! Thanks Kelli! I’ve never even bought corn syrup and probably never will, lol. This pecan pie is beautiful! 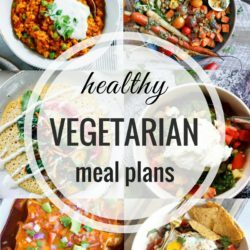 I love all of the healthy ingredients too! I just recently bought the Miyokos butter and it’s amazing! I just found out that we’re hosting Thanksgiving, so I’m in full-on recipe search mode right now. This looks so good! Pecan pie is my FAVORITE for thanksgiving but I haven’t had it in about two years because of the dairy issue! I must try this!! This looks so good! 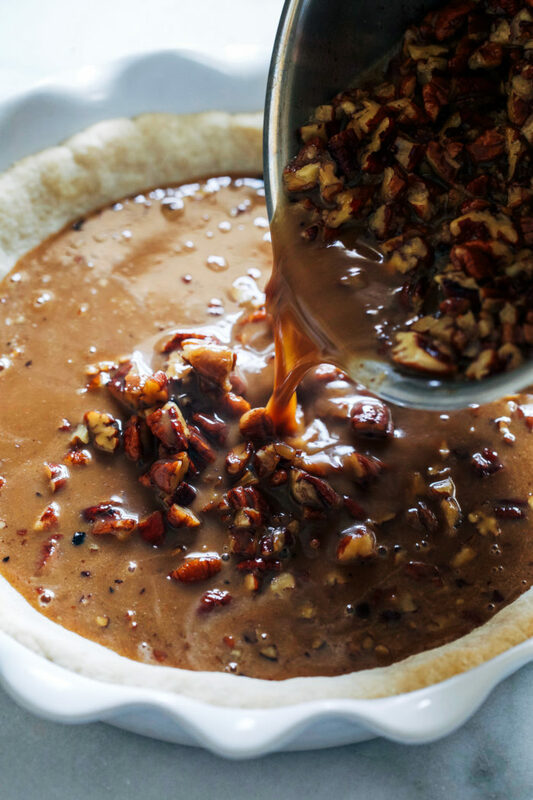 My mom loves pecan pie, so I might have to make this for an upcoming holiday at her house. Wishing you a wonderful Thanksgiving full of delicious vegan food my friend! Thanks Nicole! Same to you!! 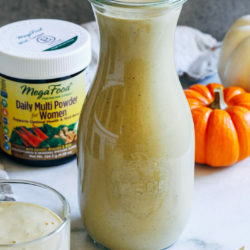 Does arrowroot powder work in lieu of corn starch? I haven’t tested it because it tends to be finicky compared to corn starch. It’s certainly worth a try but if you don’t have time to give it a test run then I would recommend sticking with corn starch. Have you tried potato starch? I find it less finicky than cornstarch. I haven’t but I will next time! Thanks for the suggestion! Can you substitute coconut sugar for brown sugar? Yes! That will work the same. Way to go Sarah! A beautiful and fabulous pie for Thanksgiving…. I always struggle with what pie to make, because I love them ALLLllll! lol! Happy Thanksgiving Sarah! xo PS. Thank you for your reminder about Miyokos butter! Is there any way I can avoid using vegan butter? Would anything work in its place? I want to make this for Thanksgiving but am not super into the idea of vegan butter. You could use coconut oil! The flavor shouldn’t change too much. If you heat the full fat in small pot that will help it blend back together. Thank you for your quick response, that worked. One last question, I just took it out of the oven and it’s bubbling and a little more jiggly than I’m used to. I cooked a bit longer, will it firm up as it cools? Does the crust need to be pre-baked? The one I bought is frozen, but its instructions say to just thaw and then pour in filling and bake the whole pie. I would still pre-bake it, if only for 5 minutes, to prevent a doughy crust under the filling. Just keep an eye on it once it’s close to being done with filling. Sometimes it helps to put a little foil around the edges if the crust starts to look too brown. Would almond milk work instead of the coconut ? I don’t know because I haven’t tested it. The coconut milk gives it a creamy texture and also helps bind because it’s solid when chilled. 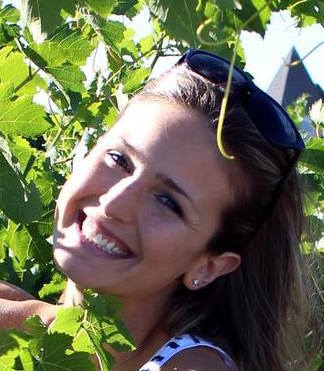 Hi Tanya! Sorry I didn’t get a chance to respond on Thanksgiving day…hopefully it firmed up in time for you! Loved this! Thanks for the easy and straightforward recipe. I made this with coconut oil instead of vegan butter and a little extra vanilla and it was delicious! Everyone had seconds. I’m glad to hear that! Thank you for the review! This pie looks great. Question. I can’t have coconut or palm oil. Do you know of an alternative vegan butter that does not contains those ingredients? I wish I did! 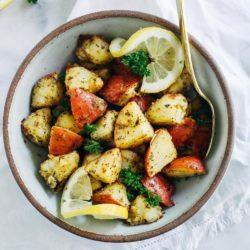 Thankfully the amount of vegan butter in this recipe is minimal so you could probably get away with using a neutral flavored oil (like sunflower or grapeseed) in it’s place. I made this for Thanksgiving and it was amazing! I want to make it for another gathering today but am short on time. Does it really need to set for 8 hours? You might be able to get with refrigerating it for just a few hours! BEST PECAN PIE EVER! I made this pie for thanksgiving and it was a success, it was super easy to make. I also made the vegan pie crust recommended in the recipe. Ingredients are expensive but well worth it, a must have treat. This sounds great! Do you use canned coconut milk or the kind in a carton? Thank you! I use canned coconut milk! Can you use coconut milk in the carton and just up the cornstarch? I wouldn’t recommend it because I can’t guarantee the texture will be right. I don’t think that I have ever logged online to review a recipe before but this one needs some serious praise. I made it for Christmas dessert yesterday and it was AMAZING! Thanks so much for your recipe. It was loved by vegans and omnivores alike. Made this for a Christmas and it was a huge hit! But I made 2 and only 1 got eaten. How long is it good for in the fridge/freezer?? So happy to hear it was a hit! I would think the pie can keep for up to a week in the fridge. I haven’t tried freezing it so I’m not sure if that will work. If so, it should last a month or two. I was gun-shy about trying this recipe because the night before I had tried a recipe for vegan Baileys Irish cream which failed miserably. However, this pie was a great success! I followed the recipe exactly and it turned out really well. It looks really pretty and tastes delicious. Thank you so much. It will be among my “tried and true” vegan staples for festive occasions. I’m honored to hear it’s on your list of staples! Thanks Shelley! I made this for Christmas dinner and it was a big hit with both the vegans and omnivores at the table. Even my mother, who usually doesn’t like pecan pie, asked for the recipe. 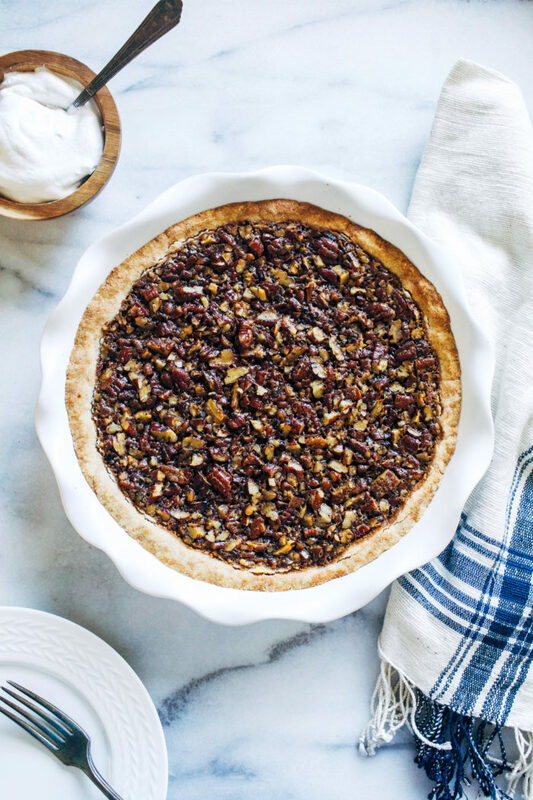 She said this pie tasted lighter and less sweet than traditional pecan pies. My pecan filling was much thicker than the pictures show (it had to be scooped into the pie shell, not poured). I’m not sure why this happened (maybe I cooked the sugary ingredients too long), but the result was good regardless. I substituted brown sugar for the coconut sugar, because that was what I had on hand, and I used a local spicy chipotle bourbon barrel aged maple syrup. I used Wewalka brand refrigerated pie crust and it worked well with this recipe. Love the addition of that bourbon syrup! Thanks for the review! This was a WIN for me. It was so easy to make and incredibly delicious. Your would never even guess that this is a vegan, healthier option. 10/10 would recommend! 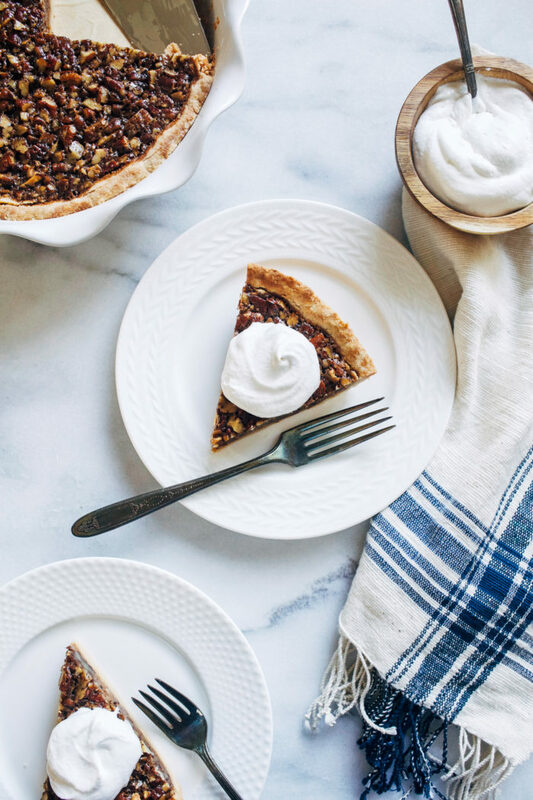 I have tried other vegan pecan pie recipes, but this one takes the prize. It has so much caramel goodness. I think I ate half of it by myself for Christmas dessert. I couldn’t stop myself from going back for more. It is addicting, lol! Thank you for the review! This recipe was so easy & quick to make! Love that the pie isn’t too sweet & the ingredients are good quality. I used regular sugar & honey instead of maple syrup. I also didn’t pre-bake the crust & next time i will add chocolate chips to it. I also only waited like 30 minutes to serve & it was perfectly fine & set. Just made this and as a southerner I will say I’m extremely impressed! My parents were shocked that it was vegan and my mom ( a southern whose obsessed with pecan pie) said it’s one of the best she ever had! 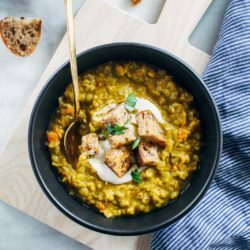 I’m so in love with the recipe!! It’s brilliant!! Thank you so much for your hard work and sharing this with us! I made this yesterday and followed instructions to a T except I used pecan halves. My pie came out with good flavor, though less sweet than a traditional pecan pie. However, the pecans were squishy, chewy, and mushy. I used raw pecans and prob should have toasted them under the broiler a bit. They gave the pie an odd texture. That is prob why the recipe calls for chopped pecans.